What is the Company's registered address and contact details? On what stock exchanges are OGDCL shares traded? Ordinary shares are listed on Pakistan Stock Exchange (PSX); GDSs are listed on the London Stock Exchange. What is the stock/ticker symbol for OGDCL? On all stock exchanges the ticker symbol is OGDC. What is OGDCL's official accounting currency? OGDCL reports all its financial statements in Pakistan Rupees (PRs). Where can I get a copy of the latest financial results announced by OGDCL? You can download the latest Annual Report and Financial Statements from the Reports section of the website. Is OGDCL's Annual Report Online? The Annual Report is available to download as a PDF file from the Reports section. Where can I find the latest presentation by OGDCL? Go to the Presentations section for investor presentations given by OGDCL. Does OGDCL have an environmental report? Yes. OGDCL is committed to environmental improvement and to ensuring high ethical standards in the conduct of its business. The Company's HSEQ report is available in the Corporate Governance section. Do you have shareholder meetings? Each year existing shareholders will be invited to attend OGDCL's Annual General Meeting. If there is a particularly important matter to decide that cannot wait until the next AGM, shareholders may be called to an Extraordinary General Meeting. How can I receive press releases and news from OGDCL? Please click on the following link and sign up to receive news from OGDCL. These are payments that OGDCL pays to shareholders. A dividend is paid for each share, so the amount the shareholders receive depends on the number of shares he/she own. GDS holders are generally eligible for all dividends or other entitlements attaching to the underlying shares of OGDCL and receive all cash dividends in US dollars. Any dividends the Company may pay in the future in respect of the Shares evidenced by the GDSs will be declared and paid to the Custodian for the Depository in Pakistani rupees. The Depositary will convert such dividends into U.S. dollars, to the extent practicable, and distribute them to holders of the GDSs, net of the Depositary’s fees and expenses. Accordingly, the value of dividends received by holders of GDSs will be subject to fluctuations in the exchange rate between the Pakistani rupee and the U.S. dollar. Dividends are normally paid to shareholders as and when approved by the Board of Directors / shareholders. What is OGDCL's dividend policy? A Global Depositary Share (GDS) is a share, evidenced by an GDR, that represents a specified number of underlying shares held in custody in the issuer's home market. The terms GDR and GDS are often used interchangeably. 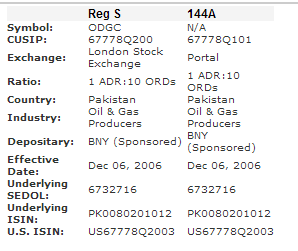 OGDCL GDSs, each representing 10 Ordinary Shares, are traded on the London Stock Exchange under the OGDC symbol. GDS holders are not members of the Company, but may instruct the Bank of New York on the exercise of voting rights relative to the number of Ordinary Shares represented by their GDS holding. Is this a good time to buy/sell OGDCL shares or GDSs? You can buy and sell OGDCL ordinary shares through a financial adviser or stockbroker, bank or institutions that offer a similar service. The commission charges for buying and selling shares vary between the different organizations. Who should I contact if I have investor related questions? Who is the Depositary for OGDCL's GDS program and how can I contact them? An ADR is a negotiable U.S. certificate representing ownership of shares in a non-U.S. corporation. ADRs are quoted and traded in U.S. dollars in the U.S. securities market. Also, the dividends are paid to investors in U.S. dollars. ADRs were specifically designed to facilitate the purchase, holding and sale of non-U.S. securities by U.S. investor, and to provide a corporate finance vehicle for non-U.S. companies. ADRs can be held in book-entry form or as a physical certificate. What is a Global Depositary Receipt? A GDR is the same as an ADR but is typically not registered with the U.S. SEC on Form F-6, and are therefore generally restricted in terms of resales. What are Privately Placed and Offshore (SEC Rule 144A / Regulation S) Depositary Receipts ? A company can access the U.S. and other capital markets through SEC Rule 144A and/or SEC Regulation S Depositary Receipt facilities without SEC registration. Rule 144A programs provide for raising capital through the private placement of Depositary Receipts with large institutional investors (often referred to as QIBs) in the United States. Regulation S programs provide for raising capital through the placement of Depositary Receipts offshore to non-U.S. investors in reliance on Regulation S.
What is Regulation S (Reg. S)? Regulation S clarifies the conditions under which offers and sales of securities outside the United States are exempt from SEC registration requirements. Regulation S was adopted by the SEC in 1990 in conjunction with the adoption of Rule 144A. These measures, taken together, significantly enhance the liquidity of a private placement or global offering. SEC rule permitting Qualified Institutional Buyers (QIBs) to trade privately-placed securities without one or two years holding requirement, thereby substantially increasing the liquidity of those securities. Where are OGDCL DRs traded and under what ticker? OGDCL has appointed M/s Central Depository Company of Pakistan Limited as its Registrars effective from April 24, 2013. The Registrars manage OGDCL's share register on its behalf. They are responsible for ensuring the shareholder details are recorded accurately, transfer of physical shares, dispatch of dividends, etc. How do I contact the Registrars? M/s Central Depository Company of Pakistan Limited.